ROOTS is a regional organization, serving fourteen Southern states and the District of Columbia. We are committed to focusing our work on this region because, although the South has a rich history of art and culture, it is one of the most under-resourced regions of the country when it comes to arts funding. As an organization working at the intersection of arts, community, and activism, we draw from the legacy of Southern social movements, and work to lift up the arts as a tool for community organizing. ROOTS’ depth of history and mission draws artists and activists from throughout our region, across the US, and around the world. Our staff, Board of Directors, and Executive Committee are also comprised of members. 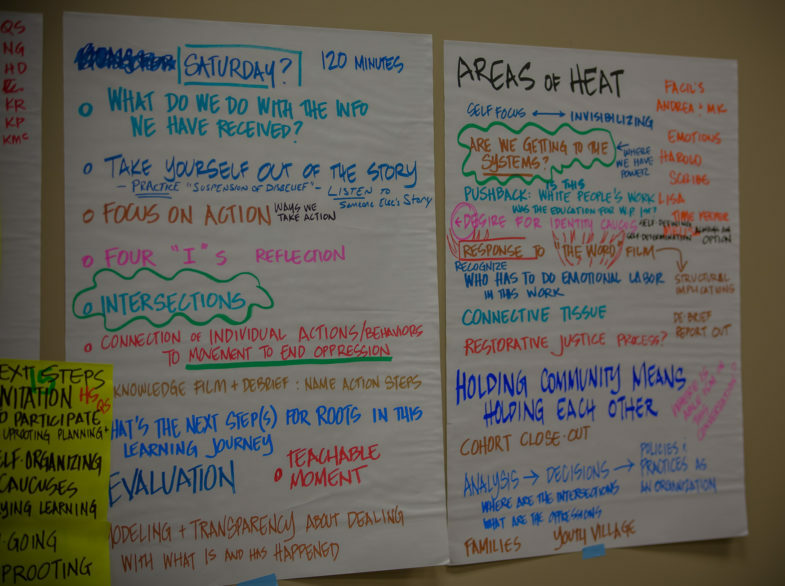 Creating space for artists to lead and make decisions by which they are directly impacted is built into the foundational practices of our organization. The work of Alternate ROOTS is, in fact, the work of our members – arts activism in grassroots communities throughout the South. It is through our membership that we build and sustain the vital connective tissue that is ROOTS – a network of support for arts and cultural organizers on the frontlines of social movements that makes us unique among our peers. We believe art is valid and important work. We celebrate independent artists as well as companies. We respect artists who work in their communities, at home and on the road. We strive for diversity and equity. We strive to promote cultural democracy. We seek to effect social change through our art. We embrace our regional identity. We encourage critical dialogue and critical thinking. We are committed to the pursuit of a just and peaceful world. We are dedicated to challenging one another, teaching one another, and growing together. Alternate ROOTS is seeking a financial advisor/consultant, to support the internal development of its next strategic plan in partnership with the Executive Director and Strategic Planning Workgroup. The below request for proposals outlines the role, expectations and competencies we are seeking for the consultant. We understand that a good strategic plan includes metrics that translate the vision and mission into specific outcomes. ROOTS seeks a consultant that understands best practices in the non-profit sector, is based in and/or works in the South, and has some background in financial modeling and development of modeling/projection tools. Ideal applicants already have a knowledge of either Alternate ROOTS, or a basic understanding of anti-oppression cultural organizing/arts and activism with an awareness of alternative, community based and values based economic structures. We anticipate the full strategic planning process to last from January – November, 2019. It is anticipated the consultant would be engaged mid year, after the broad framework of the plan and goals have been developed. As a non-profit whose budgets are determined on advanced budgeting cycles and agreements with funders, we have a predetermined amount of money to allocate towards the strategic plan financial consultant for $5,000-$10,000. We understand that market rates vary and ROOTS may not be able to meet an individual’s or firm’s rate. We want to be up front about the funds available, and ask that only candidates willing to work within this budget apply. If hired, you will work with the Executive Director to determine how you would work within the budget. Additionally, we recognize and want to honor all of the time, energy, pro bono professional services and resources that members, friends and communities give to the organization. If you or a firm are able to waive fees to support ROOTS mission with financial planning, we are open to those proposals as well. We are able to record your in-kind service donation and report on them as well. If you have further questions or to submit your proposal, please contact, Michelle Ramos, Executive Director, no later than Monday, February 11, 2019 via e-mail at michelle@alternateroots.org. Proposal emails should be labeled: NAME, 2019 Financial Consultant Proposal.